Foreign Affairs Correspondent Jonathan has covered conflicts, revolutions, natural and unnatural disasters and has won four Royal Television Society awards for Channel 4 News. Do you trust Jonathan Miller, Channel 4 News, in Damascus? Broadcast on Channel 4 news, Sunday 26th November 2011. A fraudulent analysis of two recordings of gunshots allegedly made in Damascus at the same time? First recording: number of shots 5, duration of burst 1.5 seconds; second recording: number of shots 7, duration of burst 2.2 seconds. Timing of shots in no way correlate: For example time between first and second shots: first recording 0.3 seconds, second recording 0.7 seconds. If you have a view on this Jonathan Miller episode please contact him and ask him about it. I have tried again and cannot make these two recordings of gunshots correlate in any way. Miller states: "We've compared the audio of this gunfire to what we recorded. It matches exactly." "First they came for the Communists and I said nothing because I wasn't a communist ..... "
Syria's main opposition group has vowed to cut ties with Iran, Hezbollah and Hamas, if the current government goes. Professor Johan Galtung, the rector of the Transcend Peace University, told RT, that agenda goes very well with the regional interests of some other countries. Perhaps most interesting (for this thread) is Russia is supplying cruise missiles to Syria, enabling it to deter any sea-borne attack (other, I suppose, than a sub-launched attack). Though I have no love for the Russian system, I am very glad they are stepping in to defend Syria (whose Govt. I also have no time for). But I have less time for the Brit, US, Israeli and other 'Coalition' War Criminals. Now let's see a similar defense arrangement by Russia supplying the sought-for anti-aircraft missiles sought by Iran, but denied by Moscow. Any clamour by 'West' about UN Security Council Resolutions can be deflected by bringing up the number of UN and Security Council Resolutions ignored by Israel, and the 'Western' support for Israeli intransigence. Russia and China must see that smaller countries being taken over one by one will strengthen the Western War Criminals (and yes, Russia and China are of course also 'War Criminal' nations) to enable them to ultimatly take them on. You see, those alternative news and blog sites put down by the first cited article had it exactly right. Col. Riad al-Assad has been in Turkey, working with U.S. & NATO, right inside the US Incirlik Base in Turkey, to do exactly what he vehemently denies: smuggle US weapons into Syria, participate in US psychological and information warfare inside Syria as the middle-man whom Syrian protesters tend to trust, and help with funneling intelligence and military operators across the border and night-time drop offs by air. The head of Turkey’s main opposition group has accused the government of allowing the country’s soil to be used for training Syrian armed groups, Press TV reports. “Is it appropriate for Turkey to use its soil for training armed forces with the aim of creating unrest in another country?” Kemal Kilicdaroglu, the head of Republican People’s Party (CHP), told reporters in Ankara on Thursday. “While we have lots of problems ourselves, why do we meddle in the internal affairs of another country?” he added. His remarks came after Turkey’s Taraf daily reported that Ankara was establishing a ‘buffer zone’ in Syria to provide Syrian rebels with shelter. The story above only goes as far as ‘France’ and the French factor. It stops short of France and other NATO member nations led by the United States in NATO member country-Turkey. So, okay. I was the last resort. But that’s not the moral of this post. This goes down as one more example of very many cases of intentional, willful censorship by the US mainstream media and their so-many- times-proven role as distorters of reality and gravediggers of the truth. I saw this on Sunday night but didn't have the nerve to post it. It terrified me somewhat, to be true. Explains why Obama made such a big deal of saying they were 'coming home' so many times in todays computer written speech. Thus the contradiction that was desperately kept hidden for the past decade returns to the surface: the mercenaries, formerly paid by Osama Bin Laden, have never stopped working in the service of US strategic interests since the first war in Afghanistan, including the period of the September 11 attacks. Yet they are portrayed ? ?by Western leaders as implacable enemies. Britain plans to deepen its involvement in Somalia – a land that has become a byword for instability and violence – in the new year. David Cameron describes Somalia as "a failed state that directly threatens British interests" and will convene a summit in London in February to bring together the countries currently active in the Horn of Africa state. A number of key decisions are expected to be made there, ranging from humanitarian aid to military missions. The Prime Minister's decision to tackle the Somalia quagmire is seen by some as being fuelled by the success of the Libyan venture. Posted: Fri Jan 06, 2012 9:18 pm Post subject: Is Al Qaeda Mozad? No group has claimed responsibility and the protesters blame the government and the government blame Al Qaeda. Commentators on 'Russia Today TV [Ch 85] including Tariq Ali, suggest that both are the work of a 'foreign power' working through criminal gangs active in Syria. the government blame Al Qaeda. Almost all Syrian attacks presently are targetting Assad's police and security forces - and done by well armed groups - likely frrom abroad -not at all like Egypt or Tunisia eh? This may well not be a 'suicide bombing' either - could be a drone/missile attack or any other high tech 'planted' weapon etc. God help the Syrians to win against this cowardly and evil onslaught. We went to the Russian People for help but it seems that Russians are not aware of our "petty" revolutions. The bloodiest is the one going on in Syria for a year now. The Syrian dictator Assad is using Putin's cover and arms to oppress peaceful demonstrators on daily basis, around 7000 Civilians are officially declared dead and hundreds of thousands incarcerated among which many are children. Please YouTube "Syria" and watch all the horrors inflicted so far. Assad is presently prolonging his last days in power by somehow pressuring Putin to wave his Veto in the UN against a Peace resolution calling for Assad's removal from power. If Putin ever wins the elections without first washing his hands from the murders of Syrian children, by allowing the UN Peace resolution get implemented, his vanity for twisting world's will would exponentially amplify and might, God forbid, lead him to lust for Russian children blood as well. I hope dear friends you would then still be able to handle his 3rd consecutive term, on your own. I don't know if this has been up before, but it is very important. Robert Ford was Negronte's No.2 when Negroponte (Dirty War professional from his time as US Ambassador to Honduras during the Contra war against Nicaragua) was Ambassador to Iraq. Days after intelligence reports revealed that intelligence crews from some Gulf states, Turkey, the US, France and Israel have been supervising camps for gathering, recruiting and training mercenaries and terrorists inside the Turkish territories, Turkey and Gulf states on Saturday held a meeting in Istanbul to discuss activities of their terrorist groups operating in Syria. The first results of this Gulf-Turkish meeting came with announcing a new escalatory step against Syria represented in the decision of the Arab League (AL) Secretary General Nabil al-Arabi to suspend the monitoring mission in Syria, ignoring the AL Council's decision last week to extend the mission for another month. The decision to suspend the monitoring mission came to confirm that Arab countries, on top being the Gulf states, are continuing their support to the acts of the armed terrorist groups in Syria. Today's Istanbul meeting came as a new episode in the series of conspiring between the Gulf states and the Turkish government against Syria, which was proved through the simultaneous imposition of sanctions allegedly aimed against the Syrian government, while experts and analysts as well as a number of Arabs and Turks consider that the bad impacts of these sanctions affect the Syrian people and also reach the people of Arab countries and Turkey. Observers see that the Gulf-Turkish conspiring against Syria appeared evident through the attendance of senior Turkish diplomat at the Arab Foreign Ministers Council meetings at which all decisions against Syria were made. These decisions started with freezing Syria's membership at the Arab League and continued through working to internationalize the Syrian crisis in implementation of foreign agendas exposed by the statements of the U.S. diplomat Jennifer Rasamimanana who described the League's decisions as having positive impact on the U.S. efforts to take the Syrian crisis file to the UN Security Council and pressure Russia to change its stance. Information and data indicate that Istanbul meeting held today came to discuss the ways to continue the exposed Gulf-Turkish conspiring against Syria after Russia stressed its objection at the Security Council to the Arab Ministerial Council's plan led by Qatar and Saudi Arabia and ordered by the US and Israel. Two days ago, the Israeli War Minister Ehud Barak stated that the Arab League's latest decisions against Syria are consistent with the Israeli vision and that the League and the Arab leaders are working in line with the Israeli approach against Syria. Analysts and observers place Istanbul meeting in the framework of a new campaign to pressure Syria led by Gulf and foreign countries and Turkey that are now distributing roles among themselves after the doors were closed before them from inside by the Syrian people and were beleaguered by the Russian stance at the Security Council. The European Union is preparing a new batch of sanctions against Syria, which the French foreign minister says will be the harshest yet. It comes after an EU-backed resolution that could have paved the way for military intervention, was struck down at the UN. We're also getting disturbing footage from the rebel stronghold city of Homs, which opposition sources say is being shelled by the Syrian army. There are reports of casualties - although this can't yet be verified. Earlier, opposition fighters operating out of Homs attacked a number of police patrols and army bases. Elsewhere in the country, security forces say they've cleared all but two rebel outposts near the capital, seizing vast caches of arms and explosives along the way. Our report from Sarah Firth, contains some images you may find disturbing. We bring to the attention of our readers the Observers' Mission Report of the League of Arab States to Syria. The report acknowledges the existence of "an armed entity" involved in the killings of civilians and police as well as the conduct of terrorist acts, which in turn have contributed to triggering actions by government forces. "In some zones, this armed entity reacted by attacking Syrian security forces and citizens, causing the Government to respond with further violence. In the end, innocent citizens pay the price for those actions with life and limb. "In Homs, Idlib and Hama, the Observer Mission witnessed acts of violence being committed against Government forces and civilians that resulted in several deaths and injuries. Examples of those acts include the bombing of a civilian bus, killing eight persons and injuring others, including women and children, and the bombing of a train carrying diesel oil. In another incident in Homs, a police bus was blown up, killing two police officers. A fuel pipeline and some small bridges were also bombed. " "Such incidents include the bombing of buildings, trains carrying fuel, vehicles carrying diesel oil and explosions targeting the police, members of the media and fuel pipelines. Some of those attacks have been carried out by the Free Syrian Army and some by other armed opposition groups." "The Mission noted that many parties falsely reported that explosions or violence had occurred in several locations. When the observers went to those locations, they found that those reports were unfounded. The Mission also noted that, according to its teams in the field, the media exaggerated the nature of the incidents and the number of persons killed in incidents and protests in certain towns." Arab and foreign audiences of certain media organizations have questioned the Mission’s credibility because those organizations use the media to distort the facts. It will be difficult to overcome this problem unless there is political and media support for the Mission and its mandate. It is only natural that some negative incidents should occur as it conducts its activities because such incidents occur as a matter of course in similar missions. Also of significace were attempts by officials of AL governments to pressure several of the observers into providing "exaggerated accounts of events". Some observers reneged on their duties and broke the oath they had taken. They made contact with officials from their countries and gave them exaggerated accounts of events. Those officials consequently developed a bleak and unfounded picture of the situation. group team leaders [of the Observation mission] witnessed peaceful demonstrations by both Government supporters and the opposition in several places. None of those demonstrations were disrupted, except for some minor clashes with the Mission and between loyalists and opposition. These have not resulted in fatalities since the last presentation before the Arab Ministerial Committee on the Situation in Syria at its meeting of 8 January 2012. "The Mission determined that there is an armed entity that is not mentioned in the protocol. This development on the ground can undoubtedly be attributed to the excessive use of force by Syrian Government forces in response to protests that occurred before the deployment of the Mission demanding the fall of the regime. In some zones, this armed entity reacted by attacking Syrian security forces and citizens, causing the Government to respond with further violence. In the end, innocent citizens pay the price for those actions with life and limb. In Homs, Idlib and Hama, the Observer Mission witnessed acts of violence being committed against Government forces and civilians that resulted in several deaths and injuries. Examples of those acts include the bombing of a civilian bus, killing eight persons and injuring others, including women and children, and the bombing of a train carrying diesel oil. In another incident in Homs, a police bus was blown up, killing two police officers. A fuel pipeline and some small bridges were also bombed. 28. The Mission noted that many parties falsely reported that explosions or violence had occurred in several locations. When the observers went to those locations, they found that those reports were unfounded. 29. The Mission also noted that, according to its teams in the field, the media exaggerated the nature of the incidents and the number of persons killed in incidents and protests in certain towns. According to their latest reports and their briefings to the Head of the Mission on 17 January 2012 in preparation for this report, group team leaders witnessed peaceful demonstrations by both Government supporters and the opposition in several places. None of those demonstrations were disrupted, except for some minor clashes with the Mission and between loyalists and opposition. These have not resulted in fatalities since the last presentation before the Arab Ministerial Committee on the Situation in Syria at its meeting of 8 January 2012. 75. Recently, there have been incidents that could widen the gap and increase bitterness between the parties. These incidents can have grave consequences and lead to the loss of life and property. Such incidents include the bombing of buildings, trains carrying fuel, vehicles carrying diesel oil and explosions targeting the police, members of the media and fuel pipelines. Some of those attacks have been carried out by the Free Syrian Army and some by other armed opposition groups. Since its establishment, attitudes towards the Mission have been characterized by insincerity or, more broadly speaking, a lack of seriousness. Before it began carrying out its mandate and even before its members had arrived, the Mission was the target of a vicious campaign directed against the League of Arab States and the Head of the Mission, a campaign that increased in intensity after the observers’ deployment. The Mission still lack the political and media support it needs in order to fulfil its mandate. Should its mandate be extended, the goals set out in the Protocol will not be achieved unless such support is provided and the Mission receives the backing it needs to ensure the success of the Arab solution." need for the Syrian Government to commit to the full and immediate implementation of its provisions. make contact with the Syrian Government with a view to signing the Protocol. its mandate under the protocol immediately on its signature. the ministerial level for its consideration and appropriate action. Ahmad Mustafa Al-Dabi from the Republic of the Sudan as Head of the Observer Mission. Arab organizations have thus far been appointed. Arab Republic on 22 December 2011 to discuss the logistical preparations for the Mission. that may arise. The necessary logistical and security arrangements were agreed. thereby removing the citizens’ fear of repercussions as a result of communicating with the Mission. observers took a special oath for the Mission which had been drafted by the Head. between the Army and the Syrian opposition. Some security barriers separating districts remain in place. enquiries regarding the possibility of addressing the issue of soldiers and vehicles blocked inside Baba Amr. conduct field work and meet with the greatest possible number of citizens. blockade and provide food. He further called for the two sides to exchange the bodies of those killed. day in the company of General Hassan Sharif, the security coordinator for the Government side. calming the situation inside the city. full and smooth deployment across the country. all of the States’ vital services have been affected. preparations, such as the arrival of cars and personnel. Care was taken to ensure even distribution of observers. • On 29 December 2011, six groups travelled to Damascus, Homs, Rif Homs, Idlib, Deraa and Hama. • On 4 January 2012, a group travelled to Aleppo. • On 10 January 2012, a group travelled to Qamishli and Hasaka. 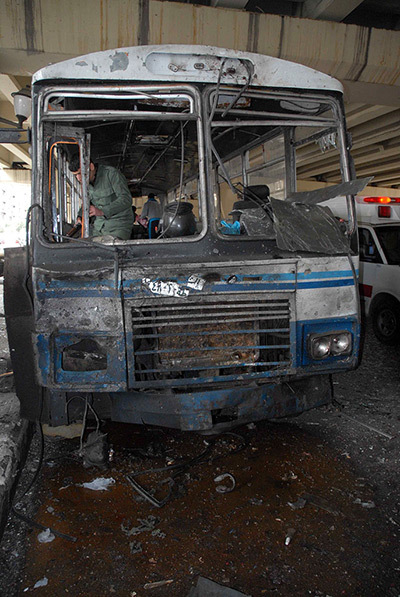 • On 12 January 2012, a group travelled to Outer Damascus. • On 15 January 2012, two groups travelled to Latakia, Raqqa and Madinat Al-Thawra. Annex 1. List of observers, their nationalities and their distribution. • Necessary equipment such as computers, cameras and communication devices. thousands surrounded the Mission’s cars, chanting slogans in favour of the President and against the Mission. zones after four days’ rest. Mission on 17 January 2012.
the situation and restraint on the part of those forces. were using flares and armour-piercing projectiles. police officers. A fuel pipeline and some small bridges were also bombed. several locations. When the observers went to those locations, they found that those reports were unfounded. incidents and the number of persons killed in incidents and protests in certain towns. on-site and not leave, something that may be attributable to fear of attack after the Mission’s departure. communicating with the concerned Government agencies to confirm those numbers. for crimes perpetrated in the context of the events from 15 March 2011 through to the issuance of the decree. that the detainees should be released in the presence of observers so that the event can be documented. • After the amnesty: 3,569. The Government has therefore claimed that a total of 7,604 detainees have been released. process and communicate with the Syrian Government for the release of the remaining detainees. view to issuing field orders and rectifying any violation immediately. organizations operating in Syria through their full-time correspondents. organizations operating permits that are valid for 10 days, with the possibility of renewal. to trail the Mission in order to do their work. journalist was killed by opposition mortar shells. prior experience in this field. the importance of giving priority to Arab interests over personal interests. at the core of their duties. Monitors must have certain traits and the specializations required for such work. them from performing their duties. unfounded reasons, which were not accepted by the Head of the Mission, while others had a personal agenda. Annex 3. List of the names of observers who declined to complete the Mission. developed a bleak and unfounded picture of the situation. difference in hotel standards or accommodation in Damascus. These issues do not warrant comment. negatively affected some observers’ ability to carry out their duties. to remain at stations outside the capital or to face the difficulties that they encountered. armoured vehicles and protective vests had a negative effect on the spirits of some observers. hostility also had a negative effect on their spirits. praiseworthy. Those who underperformed will improve with experience and guidance. that stood in the way of its work. which are not considered secure communications equipment, were used to send daily reports, instead. Chinese Embassy provided 10 such radios as a gift to the Mission. They were used in three sectors only. satisfy the needs of the Mission, particularly for transportation into trouble spots. recalled those vehicles and their drivers out of fear for their safety. which forces the observers to drive the vehicles themselves. the Head of the Mission, who allocated the vehicles according to the needs of each zone. Annex 4. List showing the number, types and distribution of vehicles and the countries that provided them. grossly exaggerated events, thereby distorting the truth. cause the Mission to fail. desired results on the ground. followed the last Ministerial Committee statement, although the situation is gradually improving. Government and those loyal to it. sectors of society; the use of torture by the security agencies; and human rights violations. Syrian Army and some by other armed opposition groups. that similar previous operations lasted for several months or, in some cases, several years. in the Protocol. All of these developments necessitated an expansion of and a change in the Mission’s mandate. allowing the Mission to complete its tasks and, ultimately, lay the groundwork for the political process. involved in the crisis thus remain unprepared for the political process required to resolve the Syrian crisis. the backing it needs to ensure the success of the Arab solution. environment that will enable it to fulfil its mandate in the required manner. contribute to the Mission’s success and prevent a needless extension of its presence in Syria. 1. List of observers, their nationalities and their distribution. 3. List of the names of observers who declined to complete the Mission. 4. List showing the number, types and distribution of vehicles and the countries that provided them. For anyone in two minds about what is really going on in Syria, and whether President Assad, hailed a decade ago as “A Modern Day Attaturk”, has become the latest megalomaniacal despot, to whose people a US-led posse of nations, must deliver “freedom”, with weapons of mass, home, people, nation and livelihood destruction, here is a salutary tale from modern history. At the heart of the plan was the assassination of the perceived power behind then President Shukri al-Quwatli. Those targeted were: Abd al-Hamid Sarraj, Head of Military Intelligence; Afif al-Bizri, Chief of Syrian General Staff: and Khalid Bakdash, who headed the Syrian Communist Party. “In order to facilitate the action of liberative (sic) forces, reduce the capabilities of the regime to organize and direct its military actions … to bring about the desired results in the shortest possible time, a special effort should be made to eliminate certain key individuals. “Once a political decision has been reached to proceed with internal disturbances in Syria, CIA is prepared, and SIS (MI6) will attempt to mount minor sabotage and coup de main (sic) incidents within Syria, working through contacts with individuals. Further : a “necessary degree of fear .. frontier incidents and (staged) border clashes”, would “provide a pretext for intervention”, by Iraq and Jordan - then still under British mandate. Incursions in to Iraq, Jordan and Lebanon, would involve: “sabotage, national conspiracies, and various strong arms activities”, were, advised the document, to be blamed on Damascus. The Eisenhower-Macmillan plan was for funding of the: “Free Syria Committee” and “arming of political factions with paramilitary or other actionist capabilities”, within Syria. Washington and Whitehall had become concerned at Syria’s increasingly pro-Soviet, rather than pro-Western sympathies - and the Ba’ath (Pan Arab) and Communist party alliance, also largely allied within the Syrian army. However, even political concerns, were trumped by Syria then controlling a main pipeline from the Western bonanza of Iraq’s oil fields, in those pre-Saddam Hussein days. Briefly put: in 1957, Syria allied with Moscow (which included an agreement for military and economic aid) also recognized China - and then as now, the then Soviet Union warned the West against intervening in Syria. Syria, is unchanged as an independent minded country, and the loyalties remain. It broadly remains the cradle of the Pan Arab ideal of Ba’athism, standing alone, since the fall of Saddam Hussein’s regime. Ultimately, the plan was not used, since, British mandate or not, neighbouring countries refused to play. However, the project, overtly, bears striking similarity to the reality of events over the last decade, in Syria – and the region. In a near 1957 re-run, Britain’s Foreign Minister, William Hague has said President Assad “will feel emboldened” by the UN Russia-China vote in Syria’s favour. “We need to work together to send them a clear message: you cannot hold back the future at the point of a gun”, said the women filmed purportedly watching the extrajudicial, illegal assassination of may be, or may be not, Osma Bin Laden and others – but certainly people were murdered - by US illegal invaders – at the point of lots of guns. Eye opening, is the list of US vetoes to be found at (iii). Jaw dropping double standards can only be wondered at (again.). The backdoor for military action was ajar with State Department, spokesman Victoria Nuland saying that US never takes any option off the table, even though they “don't think more arms into Syria is the answer." It appears the Pentagon has a similar view, as it has reportedly launched a full-scale review of its available military might. US President Barack Obama said in an interview Sunday that he believes it is possible to resolve the conflict peacefully “without recourse to outside military intervention.” However, some congressional lawmakers, including Arizona's Republican Senator John McCain, called for the US to explore the prospect of arming opposition forces in Syria. "We should start considering options, arming the opposition," McCain said. "The bloodletting has got to stop." The US and other Western powers are wary of engaging closely with would-be rebel forces without the legal protection of UN resolution, similar to the one that was passed in the case of Libya. But in the wake of Russia and China vetoing a Security Council resolution calling for Syrian President Bashar Assad to step down, they are forced to look for other solutions. Secretary of State Hillary Clinton has called Sunday for "friends of democratic Syria" to unite and rally against Assad's regime. She has also vowed to strengthen existing sanctions against the Syrian regime and seek further ones to dry up funding and arms shipments. The US outrage over the Syria veto at the UN is rife with hypocrisy – The US has used veto power 83 times primarily to block resolutions against the US and Israel for war crimes and violating international law. Human rights activists were outraged, as they should be. What is striking, however, is the response from US officials and pundits so roundly condemning the use of the veto by these two permanent members of the Security Council to protect the Syrian regime from accountability for its savage repression against its own citizens. A little perspective is required here: Since 1970, China has used its veto power eight times, and Russia (and the former Soviet Union) has used its veto power 13 times. However, the United States has used its veto power 83 times, primarily in defense of allies accused of violating international humanitarian law. Forty-two of these US vetoes were to protect Israel from criticism for illegal activities, including suspected war crimes. To this day, Israel occupies and colonizes a large swath of southwestern Syria in violation of a series of UN Security Council resolutions, which the United States has successfully blocked from enforcing. Yet, Secretary of State Hillary Clinton insists that it is the Russians and Chinese who have “neutered” the Security Council in its ability to defend basic human rights. In virtually every one of these resolutions, the United States cast the sole negative vote in the otherwise-unanimous 15-member Security Council. And some of the resolutions vetoed by the United States involved governments responsible for even more civilian deaths than the Syrian regime in its bloody yearlong crackdown. None of this justifies the Soviet-Chinese veto of the resolution challenging the Syrian regime’s repression, of course. It does, however, make the self-righteous condemnation of this most recent veto by the very supporters of many of these earlier US vetoes look rather ridiculous in the eyes of those who support human rights and international law regardless of the offending regime’s geopolitical alliances. The point of this dire evil is 1. to drive us nuts through injecting fear into our subconcious and 2. to pave the way for the next Hitler to appear - like the good guy. These killings have the hallmark of Crown Agents - founded 1833 to control the Empire by triggering faction fighting. The top of the command chain is a Star Chamber official known as the Treasury Solicitor. British, Qatari troops already waging secret war in Syria? British and Qatari troops are directing rebel ammunition deliveries and tactics in the bloody battle for Homs, according to an Israeli website known for links to intelligence sources. Four centers of operation have been established in the city with the troops on the ground paving the way for an undercover Turkish military incursion into Syria. The debkafile site said the presence of British and Qatari troops in Homs topped the agenda of Tuesday’s talks between Assad’s officials and head of Russia’s Foreign Intelligence Service Mikhail Fradkov. Qatar makes little secret of supporting the Syrian opposition with cash, arms and political support. Sheikh Hamad bin Khalifa Al Thani said in mid-January he is ready to send troops to Syria to stop the violence there. Britain insists it is not planning any military action against the Assad regime. The scenario painted by the report closely resembles Libya’s collapse into anarchy. UN Security Council resolution 1973 forbade any ground troops from intervening in Libya while creating a pretext for NATO to launch a bombing campaign against Muammar Gaddafi’s troops. However Qatar, Britain and France later confirmed they had sent units to assist the Libyan rebels. Secret French weapons drops were discovered after they fell into the wrong hands. There were also unconfirmed reports that Western special forces directed air strikes from forward frontline positions and directed combat tactics. The Libya example was cited by Russia and China when they vetoed a draft UN Security Council resolution on Syria last Saturday. Britain, France & the US, who backed the resolution lashed out at Moscow and Beijing, accusing them of siding with a regime that had ‘blood on its hands’. Assad being accused of false flags by NATO I imagine. Getting the idea of false flags into full public view. in short, how much more of the World have we got to be at war with? The Russo-Chinese veto in the UN Security Council effectively prevented a military operation against Syria. Writer and political scientist Igor Panarin believes France, Britain and the US have increased pressure against Moscow following the vote. Moscow and Beijing have been absolutely reasonable in their concerns about a possible “Libya scenario” being imposed on Syria. A similar UN Security Council resolution on Libya triggered a NATO military operation in support of an armed coup in that country, which resulted in the toppling of a legitimate government. Notably, even with Muammar Gaddafi deposed and killed, there is still no stability in Libya to this day. Not to mention all the Libyan civilians killed by NATO air strikes – something the leaders in London, Paris and Washington are reluctant to admit. Sergey Lavrov commented on his meeting in Damascus on February 7 with the Syrian president Bashar al-Assad by saying his trip to Syria was well-timed and helpful. “There is every reason to believe that the message we have brought with us [to Syria] for progressing on every track has been appreciated,” Lavrov said. Kremlin has repeatedly contributed effort to refrain Syria’s civil disorder from escalating, prevent a foreign invasion, and facilitate a peaceful dialogue between Syria’s opposing political parties. Yet the Western powers, who have long pressed for a military intervention against Syria, expressed their utter resentment over the Russo-Chinese stance in the UNSC, and then reacted with outrage to the Russian officials’ visit to Damascus. An intense and comprehensive pressure campaign against Russia promptly ensued. First, on February 5, a group of people presenting themselves as Syrian opposition activists stormed the Russian embassy in Tripoli, Libya. It is no secret that NATO spec op troops spearheaded the capture of Tripoli by rebel forces in the summer of 2011, and that the present Libyan government is under control of the West. Moreover, the reported “hundreds of Syrian activists” would have no particular reason or opportunity for being in Libya. Which means that the assault against the Russian diplomatic mission was a special operation pulled off by Western secret services. It is very reminiscent of the “stray” missile that hit the Chinese embassy in Belgrade during the NATO bombing campaign against Yugoslavia in 1999. The assault on the embassy is a blatant offense against Russia’s national security, which must be retaliated for adequately. Secondly, US Ambassador to the United Nations Susan Rice persistently refers to the “atrocities” allegedly committed by the Assad regime. No sound evidence of such atrocities has been presented so far, which reminds us of former US Secretary of State Colin Powell’s case against Saddam Hussein in 2003 and the alleged weapons of mass destruction, which were eventually never discovered in Iraq. Thirdly, caving to American pressure, Spain, Italy, Germany, France and Britain recalled their ambassadors from Syria within three days. The US has shut down its embassy in Damascus and evacuated its staff. On February 7, Saudi Arabia, United Arab Emirates, Bahrain, Kuwait, Oman and Qatar similarly withdrew their ambassadors from Damascus. All six of these Arab nations are members of the Gulf Cooperation Council. Fourthly, the French Foreign Ministry announced on February 8 that President Assad had already violated his commitments negotiated with Lavrov and Fradkov on February 7. Later the same day, the French arranged a phone conversation between Nicolas Sarkozy and Dmitry Medvedev. As the French leader insisted on forcing al-Assad to resign as soon as possible, the Russian president cautioned him against hasty measures. Fifthly, a number of Arab media outlets circulated a falsified report on February 8 alleging that Russia’s UN Ambassador Vitaly Churkin had threatened the persistent foreign minister of Qatar with “obliterating” his country. The Russian diplomat subsequently refuted the allegation at a UN-hosted press conference, suggesting that somebody is deliberately trying to put Russia at odds with the Arab world. Sixthly, the media campaign against Syria has been drastically stepped up, with practically every big-name international network joining the firing squad: the BBC, CNN, Euronews, Al Jazeera, Al Arabiya, etc. Russia wholeheartedly supports a political settlement for Syria and intends to continue its diplomatic efforts involving Damascus, Syria’s neighboring countries and Arab League member states. Apparently, the NATO heavyweights are interested in a different scenario for Syria – hence the amplified pressure on Russia. NATO’s ultimate objective is most likely turning Syria into another Iraq: a quagmire of ethnic and sectarian violence, locked in endless terrorist warfare among feuding communities. Similarly to Iraq, Syria is also a patchwork nation with its own Sunni, Shia and Christian communities. The chaos that is very likely to follow an illegitimate deposition of the Assad government may claim hundreds of thousands of civilian lives. For reference, some 700,000 civilians have perished in the war-torn Iraq since its “liberation” by the US-led coalition, with some 5 million refugees fleeing the country. Syria’s population is roughly equal to that of Iraq: 24 million. All these people are now hostages to a military gamble orchestrated by the same powers that have turned Iraq into a perpetual war zone. It would be next to impossible for Syria to survive such a massive instigation campaign without help from friendly nations. In turn, Syria is also Russia’s last stand: the recent assault against the Russian embassy in Tripoli has demonstrated that Russia could also be on NATO's list of potential targets. Syria is Russia’s strategic ally, who could assist Russia in restoring its military presence in the Mediterranean. There are also considerable economic interests concerning Russian arms and hardware sales to Syria. One important transaction of late has been the shipment of several Yak-130 lead-in fighter-trainers to Syria in January 2012, especially considering the timing of the deal. A further spread of war and chaos in the Middle East would put Russia’s national security at risk, making its southern frontiers more vulnerable to infiltration by terrorists and insurgents. That is why, along with rendering support to Syria through diplomatic, political and press-coverage means, Russia should also consider forming a Special Operations Corps to secure its national interest through preventive action in the Middle East. The statements, views and opinions expressed in this article are those of the author and do not necessarily represent those of RT. 1- First and foremost all efforts will be made to secure a U.N. ruling. For this purpose, Prime Minister Erdogan called Russian State Leader Medvedev to deliver the message, "Assad stalled us, and he stalled the Arab League. This time don't let him gain more time by stalling you as well." Should Russia maintain their current stance against U.N. intervention then the legitimacy to establish the infrastructure for a potential operation in Syria will be sought from an alternative arena. 2- Should a U.N. ruling not be reached or should it not be enough to stop Assad then the international community will come together in order to intervene and establish sanctions just like what happened in 1999 against Kosovo and in 2003 against Iraq. The initial stages will involve isolating Assad by withdrawing international diplomats and closing all political doors. Davutoglu held a series of meetings in Munich for this very purpose. In addition to obtaining Germany's support, Davutoglu also spoke with his counterparts in Iran, Qatar and Italy. While Turkey is preparing to host the meeting of the 'East' and the 'West', the first step to establish the Syrian Friends Group will be taken at the February 13th Arab League meeting. 3- The first objective of the ‘Friends of Syria’ Group, which will consist of the Arab League, the African Union, the EU and the United States, will be to stop Assad and to help the Syrian public by setting up a buffer zone in order to open a border crossing to provide food and humanitarian aid and later, if necessary, to save civilian lives. Informed sources have uncovered a US plot entailing a Turkish incursion and a full-scale Israeli strike to overthrow the government of Syrian President Bashar al-Assad. The sources said aspects of the plan such as rejecting calls by Damascus for an Arab League meeting over the crisis in the country, recognizing of the Syrian opposition as the “legitimate” government of the country and granting them offices in Turkey to work against the Syrian government, have already been carried out. As part of the plan, Syrian embassies and consulates would be attacked in several countries and the diplomatic offices would be used as bases to inflict heavy blows on the Syrian government. Firstly the Syrian government will be demonized as a war criminal and its case will be taken to The Hague and international human rights bodies. Washington will then task Turkey with sending troops across the border into Syria to incite internal friction and civil war within the country by arming Syrian civilians and the opposition against the government. In the next step, Washington will arm Wahhabi fighters and members of the Fath al-Islam in Tripoli, supported by the Qatari army and Libyan fighters, and order them to attack Syrian border villages. Israel will jump into the fray by expressing readiness to carry out military operations against Syria. Israeli Foreign Minister Avigdor Lieberman recently announced he would be visiting the US next week. He is expected to meet with US Secretary of State Hillary Clinton, US senators and other senior officials. Officials close to Lieberman were quoted by Israel sources as saying that the he will ask the US government to increase international pressure against Syria, urging Washington to go beyond sanctions in line with efforts to overthrow the Syrian government. Jordan, another Syrian neighbor, will also announce its readiness for military intervention in Syria upon receiving the US green light order. Al-Qaeda militants stationed near the Iraqi-Syrian borders will also start operations inside Syria after receiving a US-Qatari order. Syrian Television channels will then be removed from Nilesat and Arabsat satellites to prevent the Syrian government form airing its side of the developments. New Syrian passports will be issued and Syrians who do not obtain the new document will not be allowed into Western and Arab countries. One necessary condition for the success of the plot to topple the Syrian regime, according to the informed sources, will be the defection of Syrian armed forces and the prime factor in the conspiracy will be the assassination of the Syrian president. Turkey is planning to set up 2,000 prefabricated houses for Syrians seeking refuge in Turkey's southern provinces near the Syrian border. Turkey had hoped that Syrian President Bashar al-Assad would handle his country’s crisis like ex-Soviet leader Mikhail Gorbachev but he turned into former Yugoslavian leader Slobadon Milosevic instead, Turkish Foreign Minister Ahmet Davutoglu has said in Washington. Turkey's deputy prime minister Bulent Arinc criticized Iran on Sunday for the country's silence over Syria's violent crackdown on protests. Senior Military Aide to the Iranian Supreme Leader Major General Yahya Rahim Safavi blasted the US for its hostile position against Tehran, and said Washington has tasked Saudi Arabia, Qatar and Turkey with directing the regional developments against Iran's policies. Turkey’s Minister of Foreign Affairs Davutoglu reminded that Libya’s former leader Gaddafi is no longer alive because he did not heed any warnings, and stated that Syrian leader Assad has also not put a stop to the violence nor kept to the promises made. Members of the Human Rights Committee at the Turkish Parliament said on Saturday that there are special camps in Antioch areas in which individuals who fled Syria are staying and are being trained in guerrilla warfare. Turkey’s top military board reviewed the army’s combat readiness yesterday amid growing concerns turmoil in its southern neighbor could spread further instability in the region. The west, and particularly the USA, are turning the Middle East and North Africa into a no-man's land. It's become a place where no one is safe and there is complete and total instability. There are kidnappings, rapes, mutilations, burnings, hangings, beheadings...every savagery the mind can conceive of and more. All this is thanks to the terrorists the west and the USA have trained, armed and funded. Russia and China vetoed a UN Security Council resolution on Syria. Moscow and Beijing explained that if adopted, the resolution would enable NATO to 'replay' the Libyan scenario in Syria. There have already been several attempts to do so. Two blasts rocked the city of Aleppo in Syria on Friday as terrorists attacked military intelligence offices and interior troops' barracks. The attacks killed 30 people and left more than 170 injured. These huge simultaneous twin-bombings in Aleppo are obviously the work of an intelligence agency, most likely the CIA, due to their size and method. Neither are the weapons being found on the terrorists of the type you would normally think would be found on your average Syrian. The Syrian people are under attack from a foreign power and they know it, which is why they have turned out in massive pro-government demonstrations, not reported by western corporate media. That brings us to the current plotting and scheming. Pravda.Ru is informed by Syrian sources that there has been movement of chemical agents among the terrorists and that a false flag operation is planned for Valentine's Day. A massacre of colossal proportions will be blamed on the Assad government forces in order to bring down the weight of the western war dogs on Syria and to force Russia to change its balanced call for dialogue and diplomacy. This must not be allowed to happen, so we are giving notice here and now that plans for such an attack are underway, just like the Homs false flag, timed exactly for the UN resolution vote. Syrian people are reporting that many of the "dead" are seen walking around the next day. Numerous are the reports of terrorists working with western media to spread false reports, Hollywood backdrops out of Qatar, films made in other Arab countries showing extreme repression against demonstrators and claiming it happened in Syria. After failure to gain support in the UN Security Council for further interference in Syria, the western countries, particulary the USA, have been stomping their feet like spoiled, petulant children. One of their first pronouncements was that "we must provide weapons to the opposition." Read to the terrorists. The problem with this being that they have already been pouring arms, money and training to the terrorists...nothing new here, move right along. "We must consider, among other actions, providing opposition groups inside Syria, both political and military, with better means to organize their activities ..., to defend themselves, and to fight back against Assad's forces," urged the three US senators. Their "Free Syrian Army" is neither free nor Syrian. They are a gang of thugs and terrorists, attacking military leaders and ordinary Syrians. They began their terrorist activity by attacking barracks, police on duty and setting fire to tires to attract police so that they could fire upon them. How would such activity be met in any western country? Well we see what they are doing to unarmed OWS protesters: beating, tasing and every type of indignity. And these are unarmed people. This space showed Pravda readers the "unarmed peaceful civilians" in Libya. The same is happening in Syria. Don't believe for a second that the Assad government attacks unarmed, peaceful civilians. The Assad government has been more than willing to engage in dialogue and reform, but this does not sit well with the west or their terrorist stooges, whom they have directed to refuse all such negotiation. The bottom line is that the west sees Syria's strategic position in the Middle East and believes that by toppling Assad that they can also weaken Iran. Before we come to a close here, we also wish to mention another situation. It seems that many MIG29s have been sent from Hungary to Israel. Most likely the markings are going to be changed into Iranian markings, at which time they will use these aircraft to be sacrificed for a "Pearl Harbor" type attack, justifying the long sought after war against the Islamic Republic of Iran. 'Praemonitus, praemunitus' forewarned is forearmed. A word to the wise should be sufficient. The world community is not prepared to accept any further manipulations or lies from the west. The people of Syria should be left to determine their own future and the west must cease and desist from agitation and arming terrorists. Let them cram their "war on terror" where the sun don't shine. They have done more to promote the practice of terrorism than anyone in history. The arrogance of westerners puffed up with "human rights" hubris helps Mossad, CIA and MI6 to sell war over and over again, and it must stop. I received in the mail just this morning an urgent appeal from Amnesty International doing just that and I told them what they could do with it. The Syrian people's terrible ordeal shows no sign of ending. A week ago, Russia and China vetoed a UN Security Council Resolution supported by all 13 other members of the Council. They chose division when the international community should have shown unity. But President Assad should not think he is off the hook. We will use every peaceful means possible to tighten the diplomatic and economic stranglehold on this vicious regime. In Parliament last week I set out our seven point plan to step up the diplomatic pressure. The Arab League initiative remains the best chance for peace in Syria and it should be implemented. Arab Foreign Ministers are meeting this weekend to consider the options. We are working with them to set up a coalition of nations to bring the widest possible political, economic and diplomatic weight to bear on President Assad's regime. We are working to ensure that later this month the EU will adopt new sanctions against Assad's regime to help choke off the regime's sources of revenue. At the same time we will not be deterred from seeking UN condemnation of the violence and backing for the Arab League plan, either through the UN General Assembly or the Security Council. We will urge Russia and China to support this. In order to help people in Syria affected by the violence and those trying to develop a peaceful alternative to the regime, we have intensified our contact with members of the Syrian political opposition and we are calling for free and unimpeded access for humanitarian agencies to deliver life saving support to the Syrian people. On top of this, we must end any illusion the regime has that it can act with impunity in Syria. There is no doubt that mass murder is being committed. Some 6,000 people have already been sacrificed to the regime's brutal determination to cling to power. Those carrying out these crimes may well think that they will get away with it. However that is what Ratko Mladic and Radovan Karadzic, the architects of the blood-soaked siege of Sarajevo, probably thought; or Slobodan Milosevic when he presided over ethnic cleansing in Kosovo and Bosnia; or Charles Taylor when he committed his crimes in Sierra Leone. They were wrong: all have gone on ultimately to face international justice. Those ordering the siege of Homs, the shelling of Idlib and the torture of Syrian children need to be put on notice that their crimes will come to light, and that they should stop these actions now. Part of this must be to record the testimony and evidence of those who are fleeing Syria or suffering on the ground. We will be sending British experts to the region in the coming days and weeks to help gather evidence and document human rights violations, working with NGOs already carrying out such work. We must help ensure that atrocities in Syria are documented to an international evidential standard suitable for local and international courts. In conflicts of the past there was no systematic collection of evidence against those who committed heinous crimes. This has made prosecutions harder to mount, and longer and more costly when they take place. Often witnesses are required to testify many years after the event. Our work will be designed to support that process now. In the past few months, Britain has commissioned experts to travel to the Syrian refugee camps in the region to document the evidence of crimes committed by the Syrian regime. We will step up these efforts. We are also providing funding to help human rights organisations in the region gather evidence against the perpetrators of crimes. Already, the organisations we are working with have spoken to hundreds of Syrian activists, refugees and army defectors who have fled their homeland since the start of the uprising. They have collected hundreds of interviews, testimonies and eye witness accounts. This is empowering ordinary Syrians to build up a strong evidence base against the regime and security services responsible for crimes against humanity. This is only a start. I will be asking other nations to take similar action to ensure that ordinary Syrians have access to the justice they deserve. Foreign Office officials will work with our partners to set up a Syria-wide human rights abuse documentation hub to collate the mounting evidence of crime that exists. We will help ensure that it is preserved and safeguarded, in the interests of justice and of the Syrian people. I have also instructed our Ambassadors in Lebanon and Turkey to report back to me on the situation on the border and among Syrian refugees, and to assess what other support Britain can offer. At the same time, we will return to the UN Human Rights Council to push for an extension of the mandate of the Syria Commission of Inquiry, with a new focus on ensuring accountability in Syria. The world must send a clear message to the Syrian regime that those who commit atrocities will be held to account, and those taking part in them now should urgently reconsider their actions. There is a chance of saving Homs and its people from the fate endured by cities like Sarajevo in the 1990s. It requires the regime to stop the violence and President Assad to step aside to permit a new political process. It also lies in the hands of individual Syrians to refuse to participate in the regime's campaign of terror and murder. So while we step up the diplomatic and economic pressure on the regime, we will also strive to ensure that fate of its victims is not forgotten and the extent of its crimes cannot be hidden.